Giant Pumpkin Growing Tips From The Pumpkin Man: Pumpkin MythBusters: Areated Compost Tea -- Does it Work? This is the first of a series of posts on different pumpkin growing myths. The hope of these posts is to get at the heart of what is best to grow a giant pumpkin and see what the science says in regards to what works and what does not. Now science is sometimes fact (i.e. the world is round) and sometimes theory that leans towards fact (i.e. black holes exist). 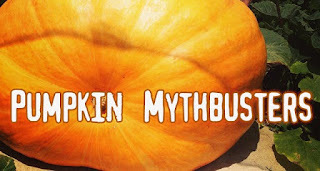 Much of what we are going to be talking about in this series leans more towards the latter, because you won't find any scientific literature or descent tests that have been done with Atlantic Giant Pumpkins so anything posted in this series is theory based on the best data and research available. Having said that, in most cases you'll find the best results often times if you go with the data, so the point of these posts is to get the best information to grow the biggest pumpkin. Aerated compost teas (ACT) are very popular with many growers and in particular organic growers. I myself have used compost teas on my plants for years. The idea behind compost teas is that by using aerated compost to brew a tea you select beneficial bacteria and fungi which are then added to the plants to help feed and protect the plants. The question is does it work? A 2007 meta data review on compost tea by Dr. Linda Chalker-Scott concluded that “Clearly, the science is not strong for aerated tea use on crop plants, much less on lawns, shrubs, and trees." Why would that be the case? Let's take a look. The most interesting study on this titled “Wood Chips and Compost Improve Soil Quality and Increase Growth of Acer rubrum and Betula nigra in Compacted Urban Soil”, by Bryant C. Scharenbroch and Gary W. Watson which looked at how trees that were treated in a variety of ways; only water, compost tea, commercial bacterial concoction, wood chips, compost or fertilizer affected tree growth. The aerated compost tea was created using good standard practices and then the tea was sent to Soil Foodweb Inc, associated with Dr. Ingham, for testing. The trees were grown in soil that was previously compacted so there would be less biology already in the soil and it looked at the resulting soil and tree growth. Note: the brewing process reduced the bacterial population by 68% and the fungi population by 99%. This does not mean however that brewing reduces the number of microbes because if you take compost and add it to a large amount of water the overall volume naturally decreases. Assuming a bulk density of 650 Kg/cubic meter, bacteria increased by a multiple of 52 and fungi doubled. Not bad right? Aerated compost tea (ACT) did have some effect on density, but other than that the testing found little to no difference. ACT shouldn't have added much in the way of nutrients. It is mostly just water. The interesting thing is that respiration did not increase at all. Increased microbial activity over time should show an increase in respiration (more microbes should mean more CO2), but it did not in this study. The more interesting thing from this study for giant pumpkin growers is how just adding compost does show the type of response that you would have expected ACT to show in terms of respiration. So the question I have to ask myself is if the point of taking the time to make ACT isn't showing much of a response in terms of microbial activity, but just adding compost does give you that microbial response, then why not just top dress with compost? Depending on what your soil has in it already, there might be good reasons to not top dress with compost. Mostly adding more nutrients in an already overloaded soil. But if you want to increase microbial activity, then compost is clearly the better way to go than ACT. So what was the long term affects on tree growth in this study by ACT and the other amendments? Water and ACT had about the same amount of impact on tree growth according to this study. Now, obviously this study is on trees grown in compacted soil and we aren't growing trees. There are other studies that have found similar results although more encouraging results however with different plants. Is putting ACT on leaves beneficial? There isn't enough good science to give an opinion either way. Will I be using ACT on my plants going forward? Yes. But let me explain why. I think the myth of using ACT on the soil to build biology is busted (mostly) according to current research. The science doesn't show that it adds significant value, but there is some. But I think there could be a case for putting it on leaves and I think you could even make a case for putting it on the soil if used in particular ways. Here is my reasoning. I like to brew compost tea with alfalfa pellets. My thinking is that by doing so I can extract triacontanol (a growth regulator) from the alfalfa. It is clear from the studies that some biology comes from the compost tea that adds some value, but I think the triacontanol from the alfalfa could have more benefit and it is good way to add it without adding all of the NPK from the pellets if you don't need it. Would it just be better to add alfalfa pellets to the soil? Definitely. I always add some in the spring when doing my final prep, but alfalfa has a lot of NPK and heats up a fair amount as it breaks down and I don't want roots burning up by applying it later in the season, so compost tea with alfalfa seems to be the next best solution. Some further notes on ACT. There hasn't been a lot of great studies done on it. Some of the challenges is the researchers in order to get their paper into a peer reviewed science journal have to be able to lock down variables and show what in a compost tea is producing results (if any). To do that with an ACT would be very challenging because there is a lot of variables and a lot of recipes with different brewing times that would all have to be evaluated, but bases on current data ACT may not be worth the time it takes for the results from soil application. I'm sure you could find more than one world record pumpkin grown without ACT. Interesting. I'd be curious to see if different types of compost teas have more of an effect. The tea I used the last time I had a patch seemed to make the leaves really perk up - more than just using water alone. That tea was made using composted worm castings. Maybe just watering with water that had a chance to dechlorinate made a difference, even if the microbes didn't?